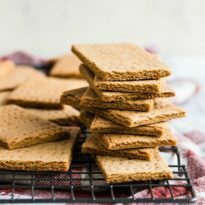 An easy recipe for Homemade Graham Crackers. Made with 100% whole wheat flour and molasses, these are so much better than store-bought crackers! In a medium bowl, whisk together flour, baking soda, cinnamon, and salt. Set aside. In a standing mixer fit with the paddle attachment, or with an electric hand mixer, cream butter and sugar together. Reduce speed to low and add molasses and vanilla until combined. Increase speed to medium and beat until light and fluffy, about 3 minutes. Reduce speed to low and add flour mixture until incorporated and a soft dough forms. Scrape dough onto a work surface and knead gently to form a ball. Divide in half and knead each ball on a bare work surface until pliable and smooth. Adjust oven rack to the middle position and preheat oven to 350 degrees. Generously flour your counter or a piece of parchment paper and place one ball of dough in the center. Pat into a 5-by-6-inch rectangle, sprinkle with flour, flip, and dust again, Working from the center out and adding more flour as needed, roll the dough until roughly 15-by-11 inches and very thin. Slide onto am aluminum baking sheet and brush away excess flour. Repeat with remaining dough. For grocery store look-alike, score each sheet of dough into twelve 2 1/4-by-4 3/4-inch rectangles and dock with a bamboo skewer or the narrow end of a chopstick. Otherwise leave the dough uncut. Bake until crackers and firm and darkened, about 20 minutes. Immediately cut along the pre-scored lines with a knife, or cut into free-form shapes using a pizza wheel. Cool to room temperature directly on the baking sheets. The graham crackers can be stored in an airtight container for up to 3 weeks at room temperature or frozen for up to 3 months. The dough may be wrapped in plastic and refrigerated for up to 1 week. Bring to room temperature for 30 minutes before using.